We get a double-dose of Ross Island Bridge goodness today. The top photo, with all the construction equipment, shows work crews grading and preparing to pave the west end bridge approach. 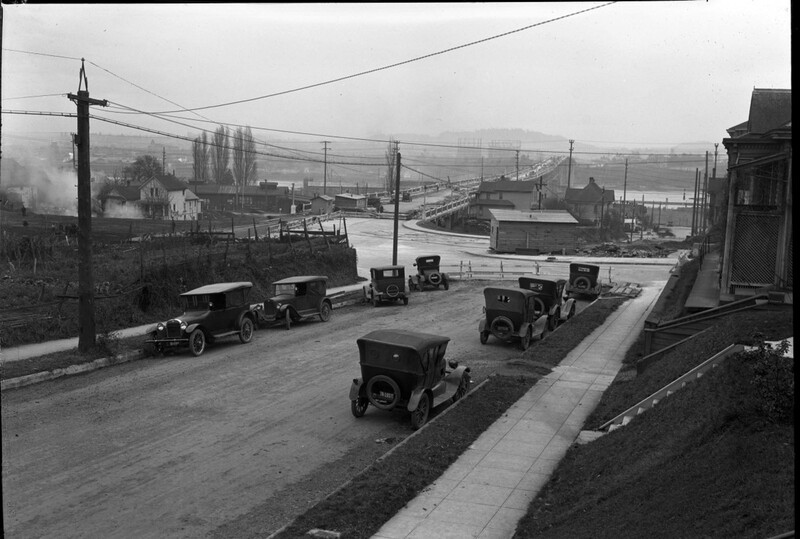 The second photo, with the cars parked along SW Grover St., shows paving in that area complete, but with more work to be done before the bridge can open. Your location finding skills will be tested today. 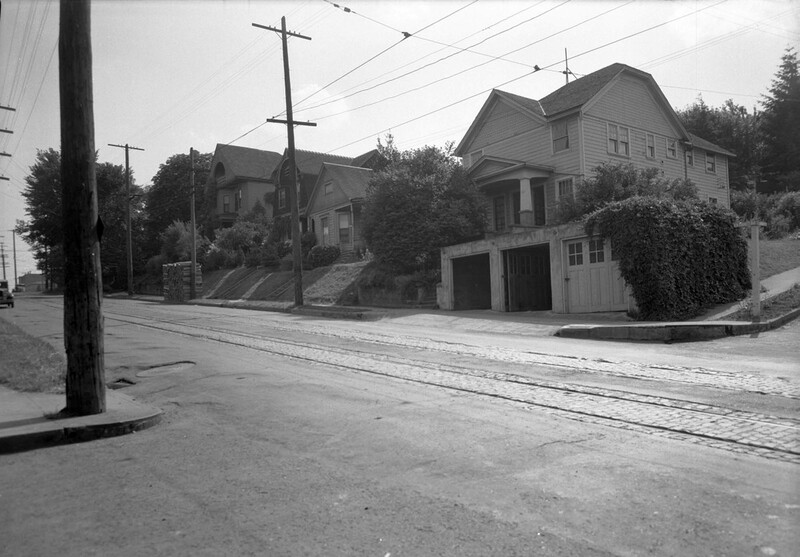 This street is somewhere on Portland’s west side, and all those houses are still there. Good luck! 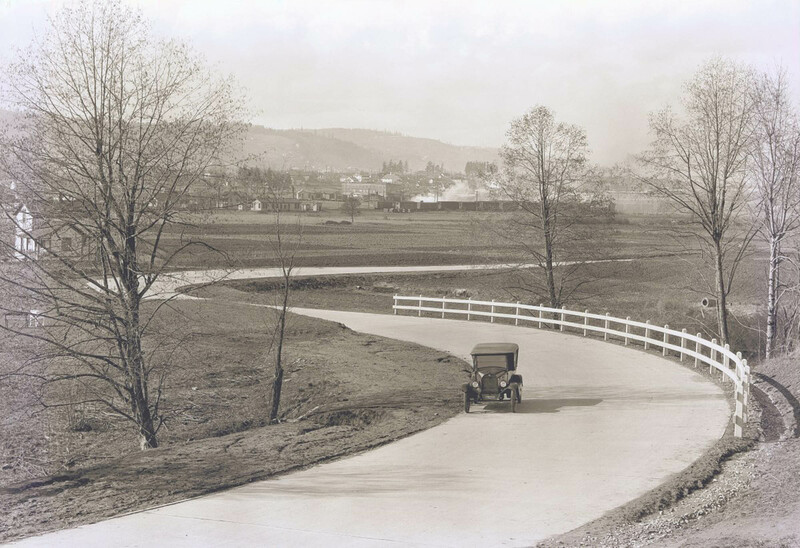 It’s a lovely day to be motoring down SE 28th Avenue just west of Reed College. The area in the distance is no longer quite as rural as it seemed to be in 1928. 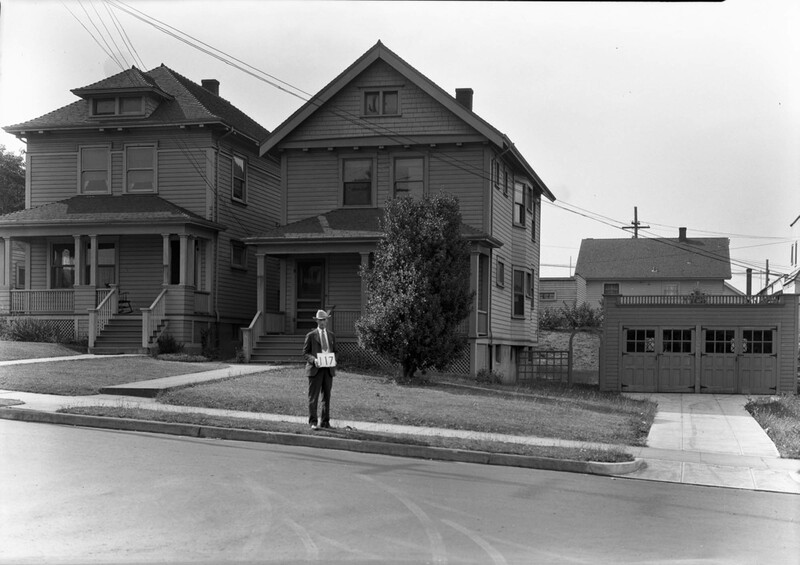 We meet our mystery Number Man again, this time in front of 3136 and 3138 East Burnside in 1929. Both houses are still there, as is the garage. 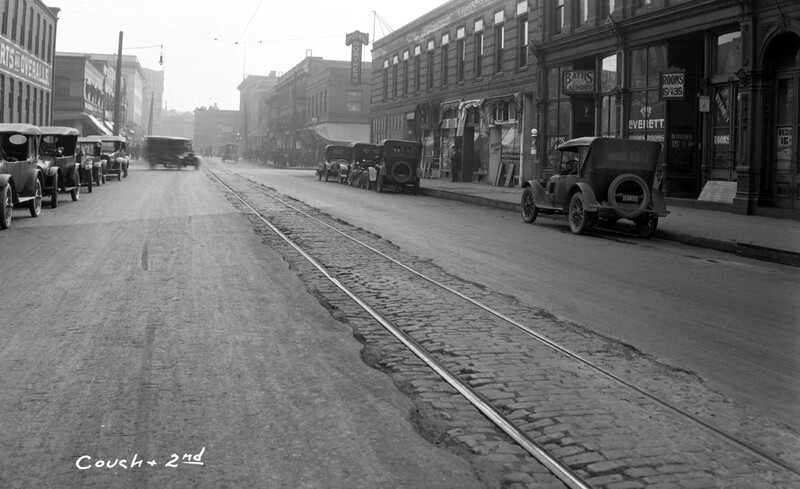 An excellent photo looking south on NW 2nd Avenue towards Couch Street. Most of these buildings still exist, and I’d be willing to bet those tracks and Belgian blocks are still under today’s pavement, too. 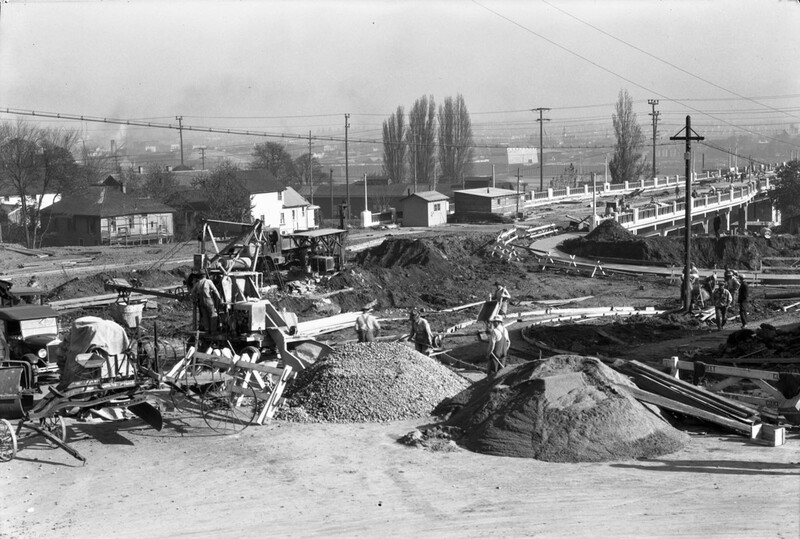 The people enjoying our spectacular autumn weather along Tom McCall Waterfront Park would little recognize the same scene 90-some years ago. 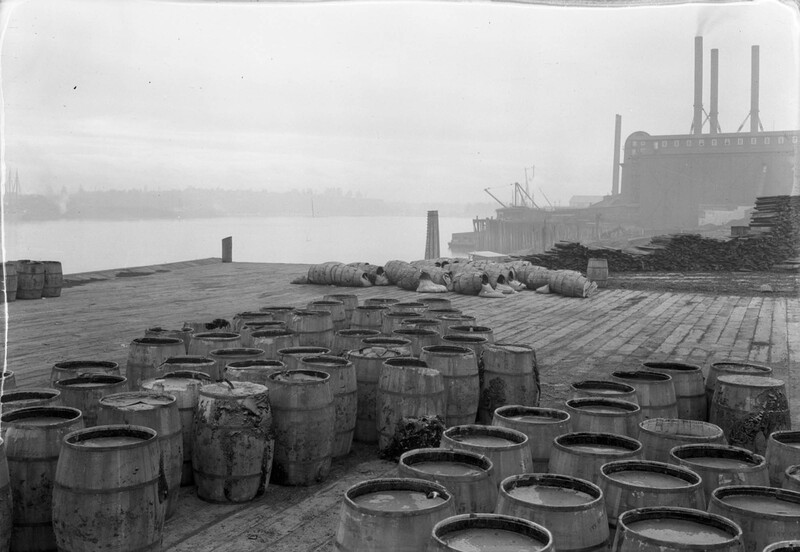 The dock at the foot of SW Jefferson Street then held barrels of tar for paving projects; the waterfront still has this physical configuration at the south end of the pavement and seawall. Riverplace Hotel and marina now replace Northwestern Electric’s Lincoln Plant in the distance. 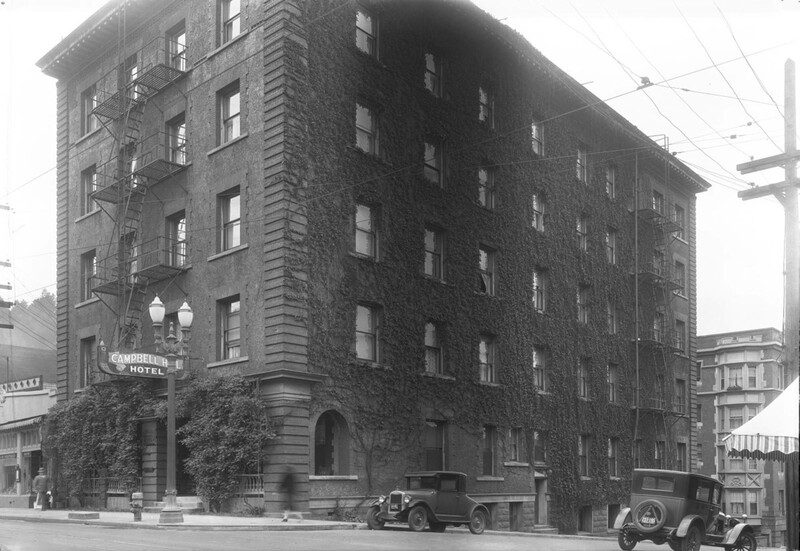 A very pretty image of the extant, and ivy-covered, Campbell Hill Hotel (now The Victorian apartments) on the northwest corner of West Burnside & NW 22nd Place, circa 1927.